Dad and I felt it was high time to take another (literal!) page out of Paul Hayward’s More Intriguing Dunedin Street Walks. 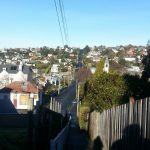 We were sure that we’d find City Rise, which lies on the slopes above the central city and is one of Dunedin’s older suburbs, a suitably intriguing destination. 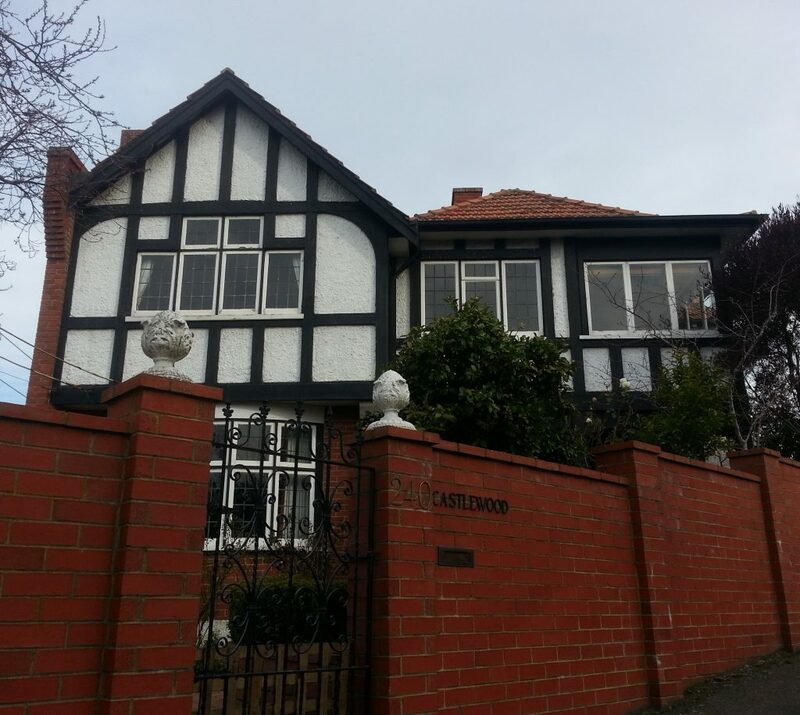 We began as instructed outside the elegant 1914 Winterslow house on Duncan St, named after its owner Frank King’s home village in Wiltshire, which I just missed on my overseas journeys. It did however seem recognisably similar to the houses I’d seen in England – which just goes to show that our distant nations may be closer intertwined than we sometimes feel. At the corner with York Pl we found another fascinating triangular house, though this time not (as far as I know) one that has ever been used as a roller rink. 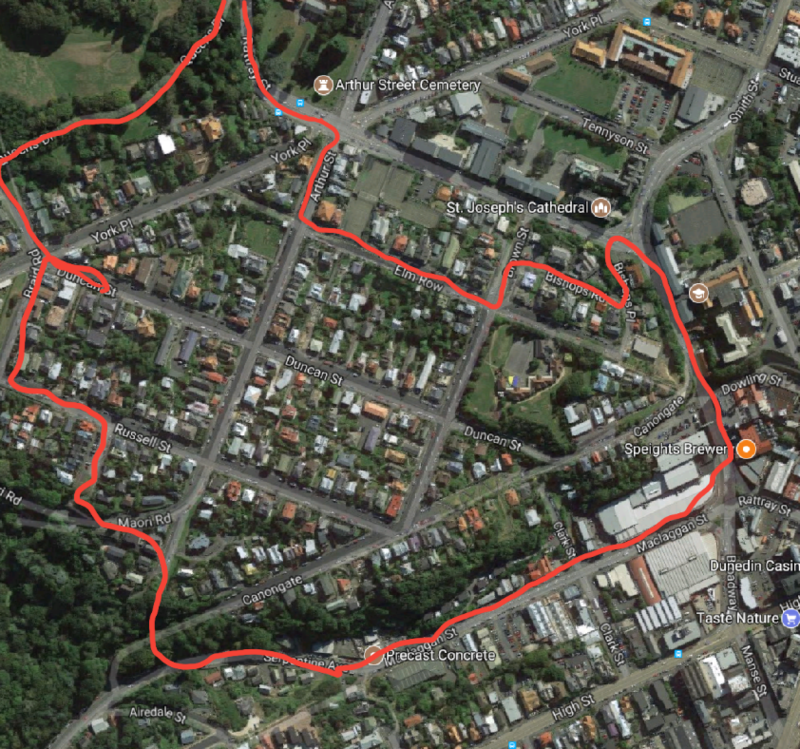 Up Braid Rd, we retraced some steps from our Town Belt journey earlier in the year before making a hard right on to Rattray St.
Our meandering course had brought us to the park at the corner of Arthur St and the obelisk thereon. In surprising contrast to the children at play here, my guide advised me that this was Dunedin’s first cemetery, with the first interment occurring in 1846 – of James Campbell, a surveyor’s labourer. Fittingly, Dunedin’s first christening ceremony also took place on the same day, making it a strange day of firsts for Wesleyan minister Reverend Charles Creed. From 1865 the steep and inconvenient site was closed to new burials and quickly deteriorated into a shambolic state, with cows knocking over the headstones and disrespectful neighbours stealing the pickets for firewood. I was somewhat disturbed by the thought that children might be frolicking over the bodies of our earliest settlers, but further research assured me that most occupants of the cemetery had been relocated to the Southern Cemetery in 1879-80. Those whose families declined the offer of new burial sites are interred in a single grave beneath the memorial. The site was turned into an elegant park, although the city did consider trading it with the Anglicans’ cathedral site in the Octagon in order to secure a spot for the first free public library – but in the end they purchased a building on Moray place and the park remained in the public’s hands. The obelisk records the names of those known to have been buried here, about eighty in all, although some may still be missing. 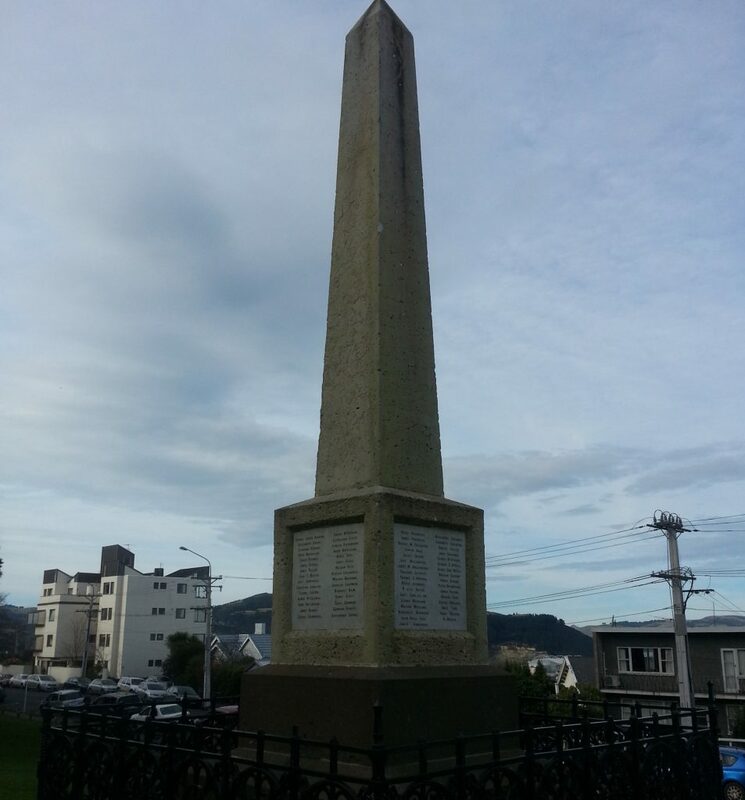 The fourth and final face of the obelisk commemorates the children who died at sea on the long voyages to New Zealand, such as those who are interred in Quarantine Island’s sad little cemetery, or who were born on the Surat. Next we found our way to Castlewood, the even more English-looking Tudor manor inhabiting one corner of the six-way York Pl intersection. It was designed by Harry Mandeno, but that was just a warm up for him, as he later designed King Edward Technical College and our own Town Hall. We were then supposed to catch a grand front view of “Little Olveston” but we discovered it hidden behind a wall of foliage – I suppose a few things have changed since our guide was published 19 years ago. This lesson was learned anew as we were directed to look over the “bowling green” to observe the highlight of our journey. The bowling green now appears to be a community garden, which to me seems to be a far better use of the space, but maybe that’s just because I never was any good at even the most sedate of sports. But mostly, I was concerned by the fact that we could not locate the object of our search, a grand balcony left over from the demolition of the 30-roomed May Villa. Maybe it’s behind that tree? Moving on, we discovered the sunken street of Elm Row, upon which we were forced to choose between the high road or the low. 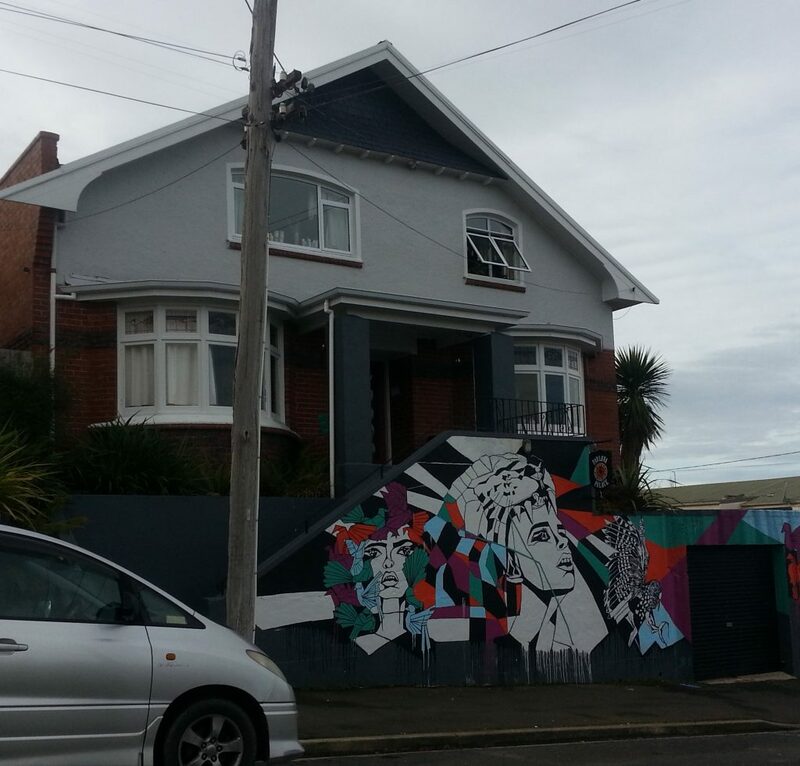 We made our choice, and soon after stumbled upon some unexpected street art, created by Dunedin artist Maggie Covell in 2015. 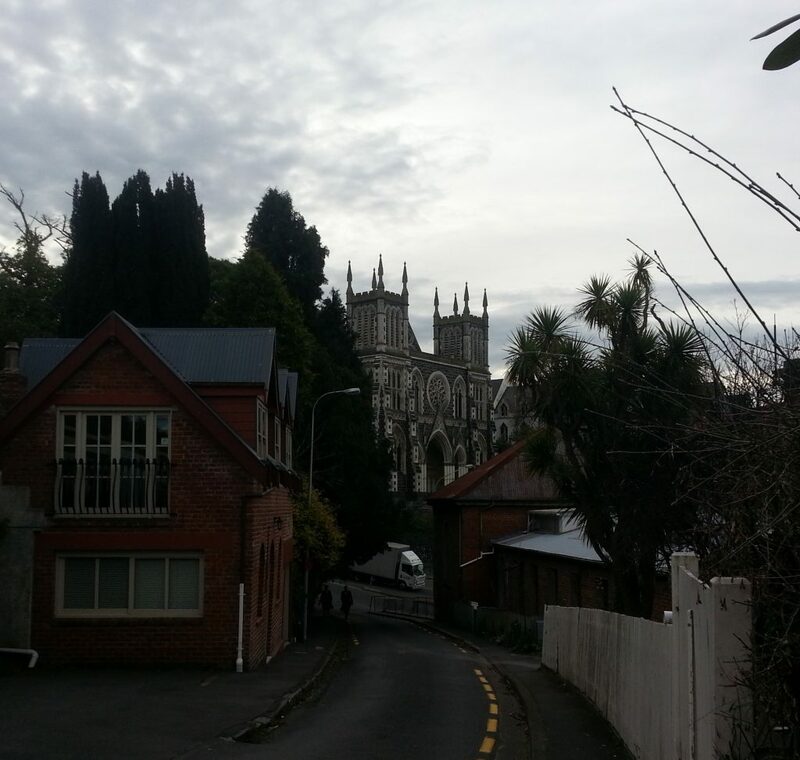 As instructed, we next ventured into the narrow Bishops Rd and entered Dunedin’s “Vatican”, the sector of our city inhabited by a cluster of traditionally Catholic buildings. First was the 1920 Christian Brothers residence which was once home to 13 teaching brothers of the old St Pauls High School but is now a hotel. 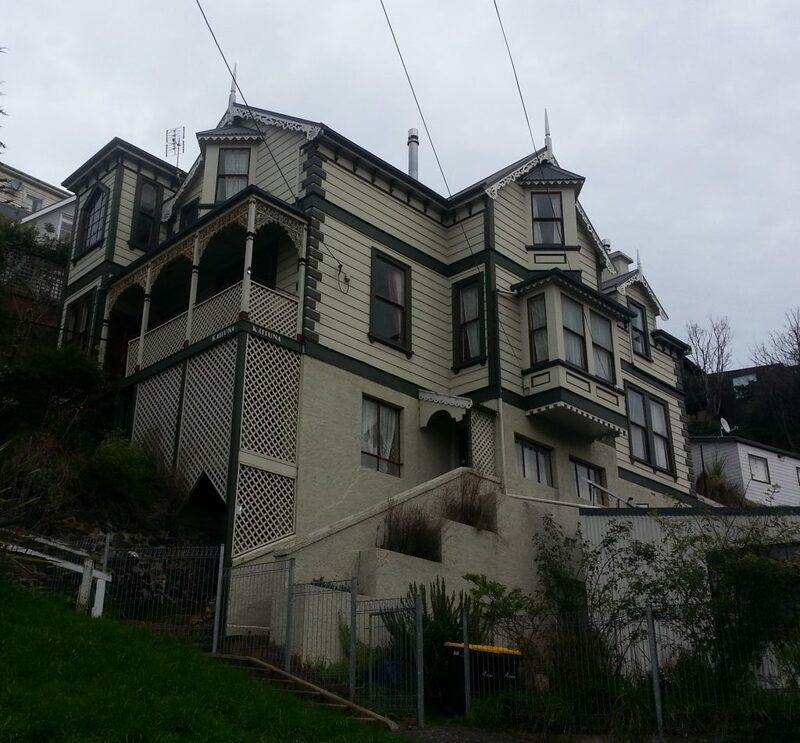 Next came the 1871 Rockmount, Dunedin’s Bishop’s residence for over 125 years and now Hogwartz backpackers. Unfortunately both were quite difficult to get a glimpse of beyond the high fences and surrounding trees. We turned left toward Rattray St, and were finally able to feast our eyes. The Cathedral hove into view, but before we move on to that the brick building closer by deserves our attention. This unique little gem makes this narrow street – so much better suited for horses and foot traffic than for modern cars – the perfect place to pause for a moment and imagine ourselves back in the 1880s. Just to our left is the coach house building where Bishop Moran keeps his carriage, and in the distance is the brand new Catholic Cathedral, though they say that it is not yet finished and one day a spire will be added – then the building will tower twice as high! Returning to 2017, we are still waiting for that spire. And if we step forward a little further the sprawling but empty Dominican Priory appears. Since I explored it last year the Diocese has received a large grant allowing them to start work on replacing the roof, and I hope that means I may soon see it brought back to life. 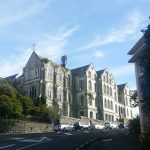 We turned away from these grand monuments to Dunedin’s Catholic heritage and headed down Rattray St along the rear of Otago Girls’ High School, which I attended in the early noughties. This brought us to something else that always fascinated me on my morning bus rides – the lot next door full of rickety structures and weeds. But we live in a golden age of discovery, and I need wonder no more about this strange lot with its old-timey industrial chimney. This was part of the 1888-9 Speight’s brewery redevelopment in which this area was made into a cask-washing yard between the office (still extant brick building below) and the malt house behind. The chimney belonged to the boiler house, and it was during this work that the first spring water was found here. 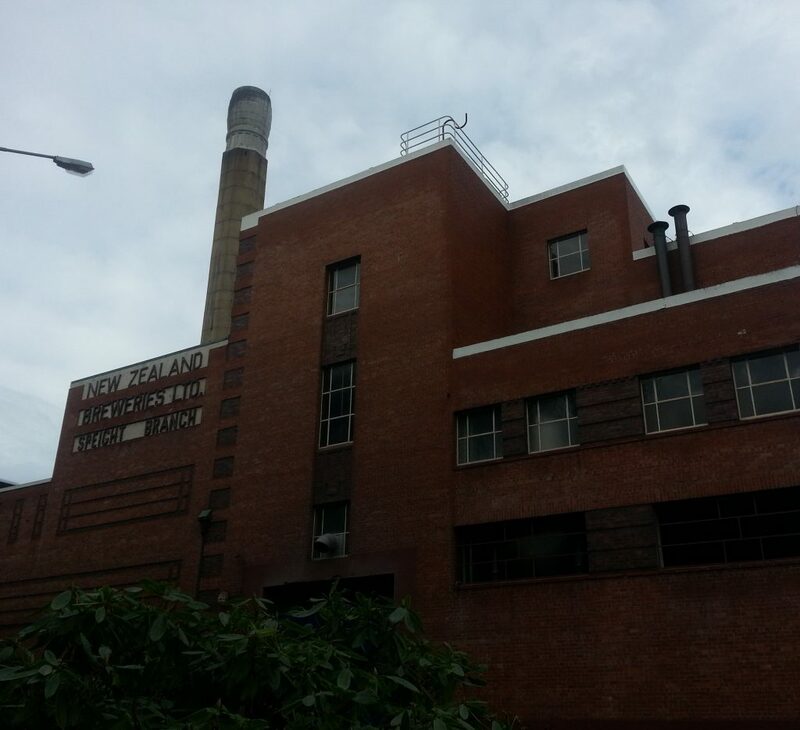 A little further down the street is a far more famous chimney – that of our current incarnation of the Speight’s Brewery. Established in 1876 by three partners, Speight’s was New Zealand’s largest brewery by 1887 and merged with nine others in 1923. This building is much different than it was even 19 years ago when our guide was written, in large part due to an event none of us expected – the Christchurch Earthquakes. After the Christchurch production centre was damaged, the great brewing alliance moved its South Island operations to Dunedin and in 2014 the Speight’s Brewery underwent a massive $40 million makeover to expand its production capacity and meet new earthquake safety standards. It is now capable of pumping out 24 million litres of beer per year (I wonder how that stacks up against the amount Scarfies consume!). Not stopping for a beer or even a drop of water from the spring tap, we continued down Rattray St and turned into Maclaggan St to immediately discover another fascinating building. 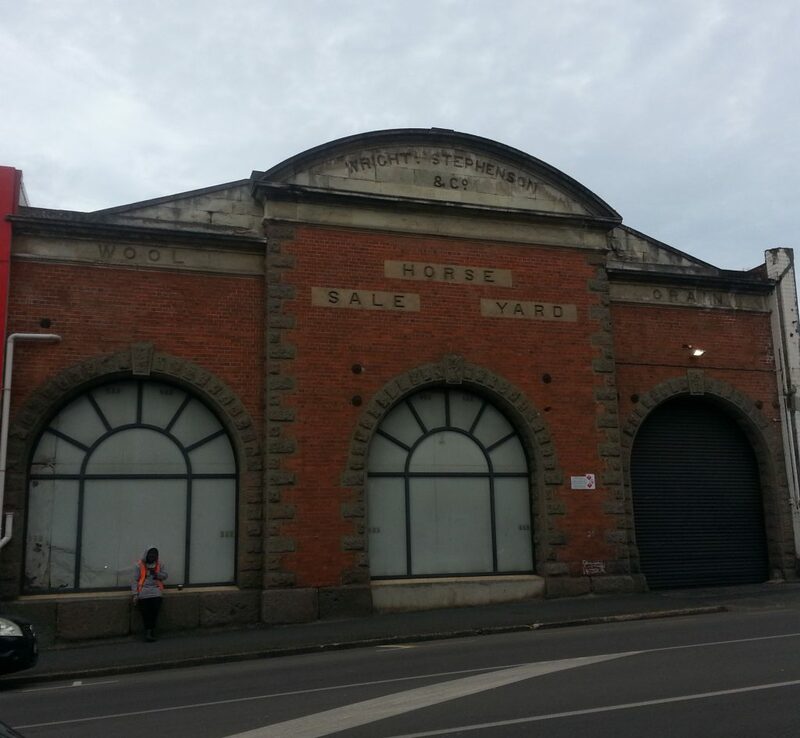 The 1889 Wright, Stephenson & Co horse sale yard building is one of surprisingly few monuments to a company that dominated stock and farm supply in early New Zealand. In fact, it still lives on today – after many acquisitions – as PGG Wrightsons. We marched on up the street, past the now-closed Clarendon Hotel – so no stop for refreshment here as Paul suggests – and drew level with the land that once belonged to William Buskin, hero of our last story. Sadly there is no longer any sign of Exeter House or the cottages that once stood thereon, only a modern commercial building. But perched slightly above are some beauties that perhaps give us some idea of what they may have looked like. 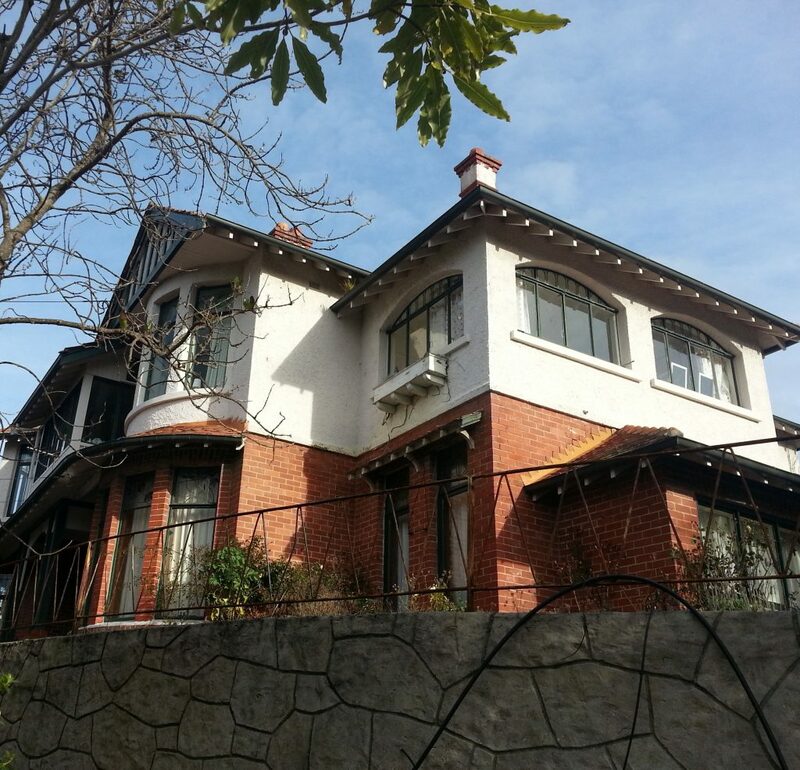 My favourite (and my mum’s) is Kaituna, the eclectic 1893 puzzle-house that may have been named after the creek more properly called Toitū, which runs down this valley. 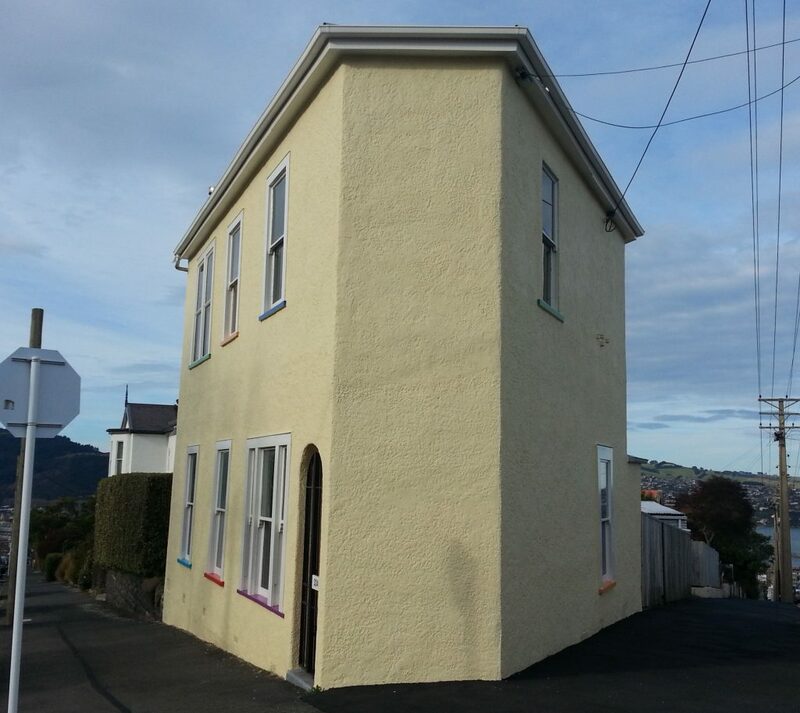 This and other houses on this block were built by Henry Frederick Hardy, better known as H.F. Hardy, who went on to become a prominent architect and Dunedin City Councillor. We powered up the steps here, which hold the joint record with Arthurs Walk in Waverley for the longest public flight of steps in Dunedin. 288, apparently – I was too focused on getting to the top to count. 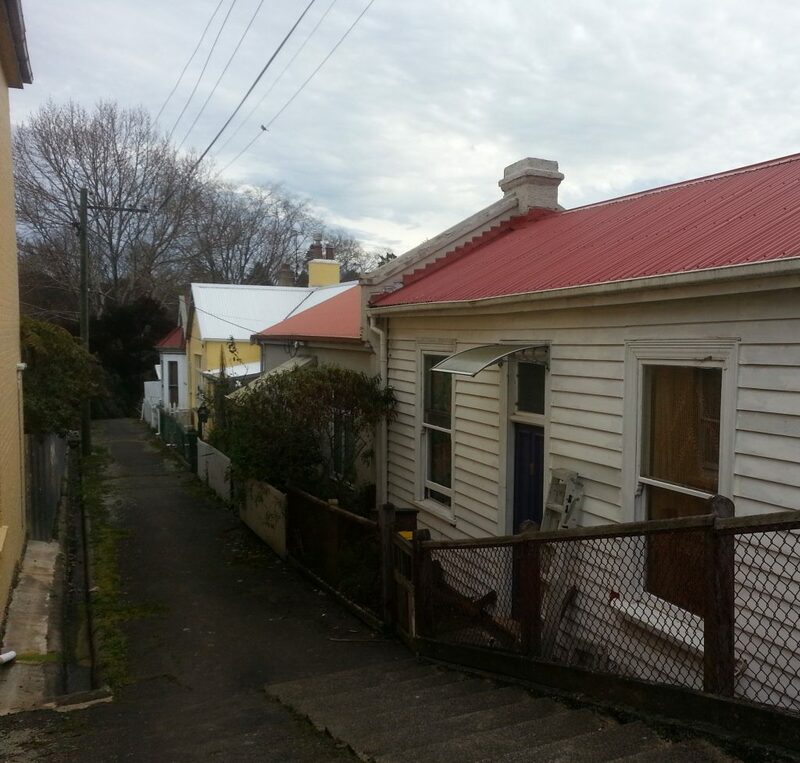 Then it was back down to Serpentine Ave and into the Town Belt once again, emerging only once we located Adam St and it’s super-cute row of colourful two storied houses. Turning into Russell St, we found a row of tiny workmen’s cottages hidden down a side path, which were also pretty cute. 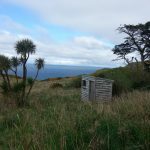 Amazing what hidden gems can be found around Dunedin if you just look! That was the last stop on our whirlwind tour of City Rise, in which we had discovered a playground cemetery, stumbled across unexpected street art, found a window into the 1880s and explained a previously unexplained abandoned lot. 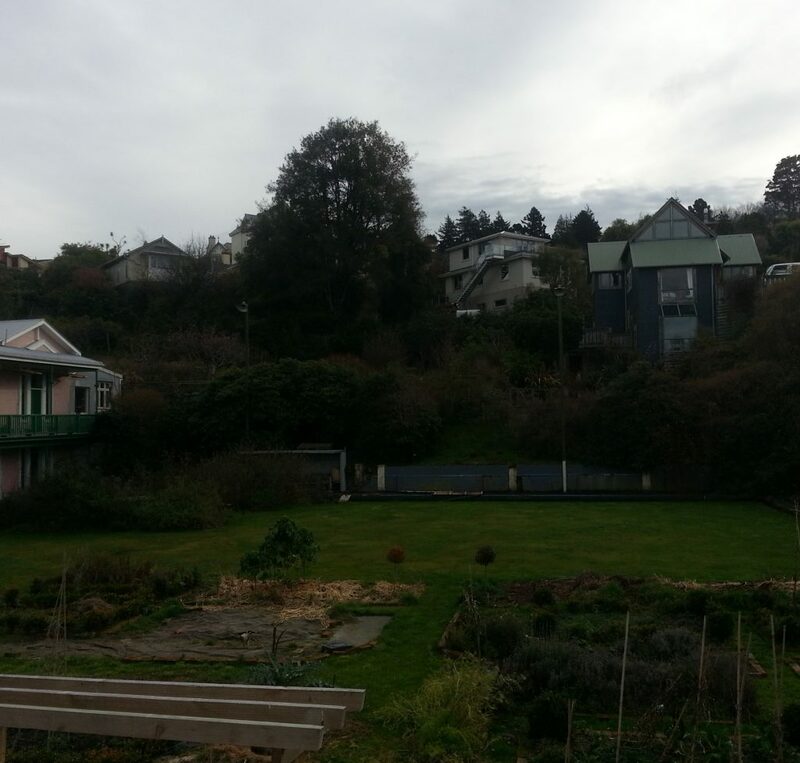 But now home was calling, and we fled this hilly suburb of Old Dunedin and its steel-grey skies for the warmth and hot tea of home. With this walk complete, we have tested all but one of the adventures in Paul’s little blue book – and eagerly look forward to sampling the last! Thank you! Just amazing what hidden gems there are in the city. Great piece of writing again. Thanks for the link, charming is definitely the right word! Yes, 19 years…hard to believe! I came aross your blog and took the liberty of spreading it further by putting in on our CITY RISE UP, Facebook. Thankyou for your exploration for our little neck of the woods which we are trying to preserve and enhance. Take a look and perphaps tick LIKE or FOLLOW. When we make submissions (like- please reinstate out bus!) they like to know how many followers we have. 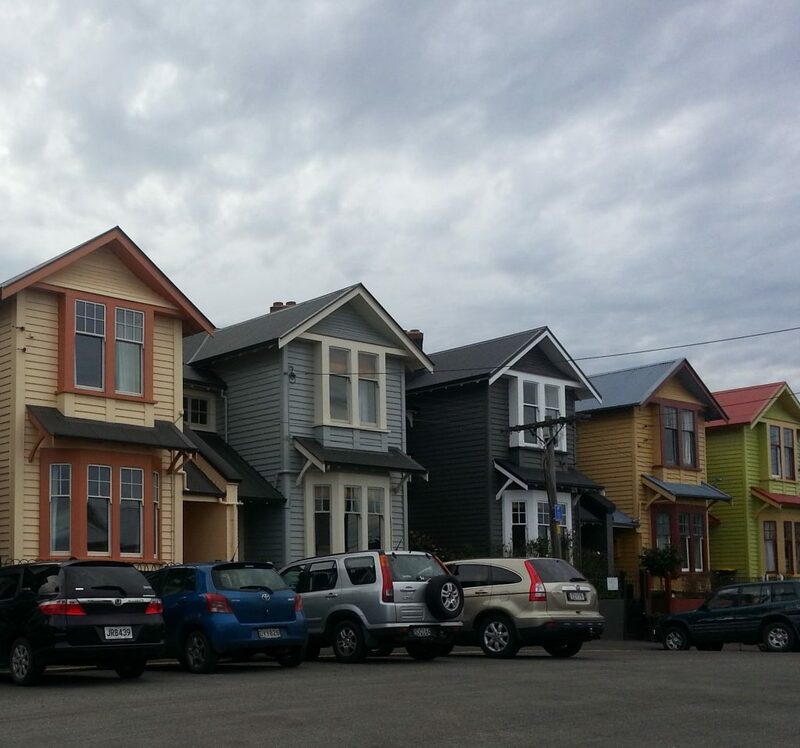 *An umbrella group for those working to smarten up Dunedin’s inner residential zone, protect its heritage and safeguard the wellbeing of all residents. Thanks for the share! I’ve given your page a like! With Paul having written seven (that I’m aware of) of these fascinating books, there is plenty of material to keep you busy for a while yet! Well done, enjoyed reading your blog. Thanks for this great photo essay, Amanda. ‘Intriguing City Rise’ is now a heritage precinct! 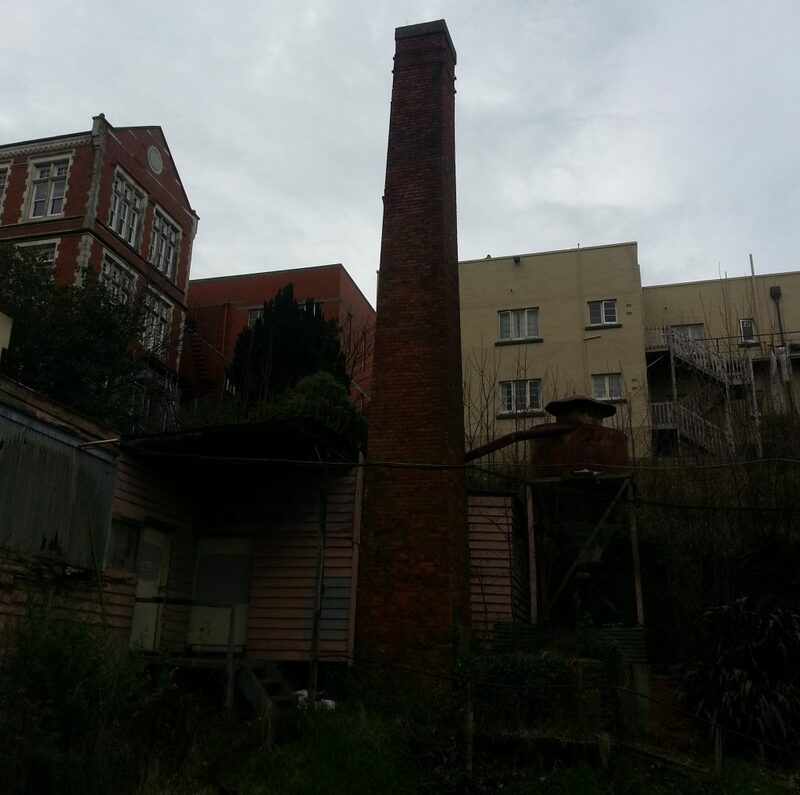 This is a major step in preserving the character and heritage of this fascinating part of Dunedin which is already experiencing a resurgence in interest and pride. Since you published the photo with the former bowling club lawn in the foreground it has been transformed into a gorgeous potager.